I know you may be tired of me evangelizing about squash. But please hold on! The best is here. Several lovely blogging friends are helping me share a whole week of winter squash recipes from my book, Smitten with Squash. When you take a peak at the Gluten-Free Delicata Donuts or the Fresh Herb & Gruyere Spaghetti Squash Saute, I think you’ll fall in love with the curcubit family as much as I have. I adore this splendid autumn salad that includes some of Minnesota’s very best natural ingredients. Butternut squash works well for this dish because it holds its shape beautifully after being roasted. 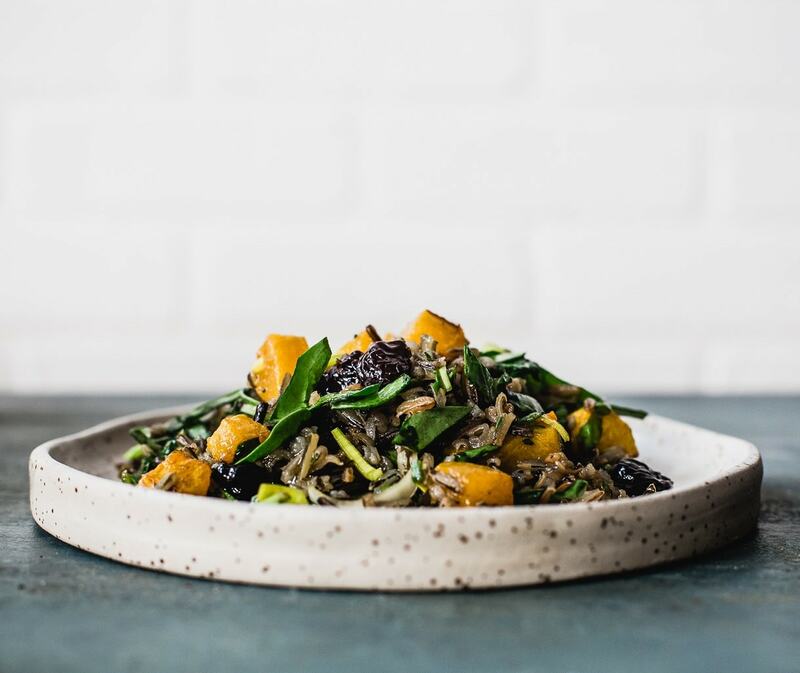 The combination of nutty wild rice, a simple maple dressing, and fresh herbs are not only delicious together, but their vibrant colors combine to make one stunning dish. 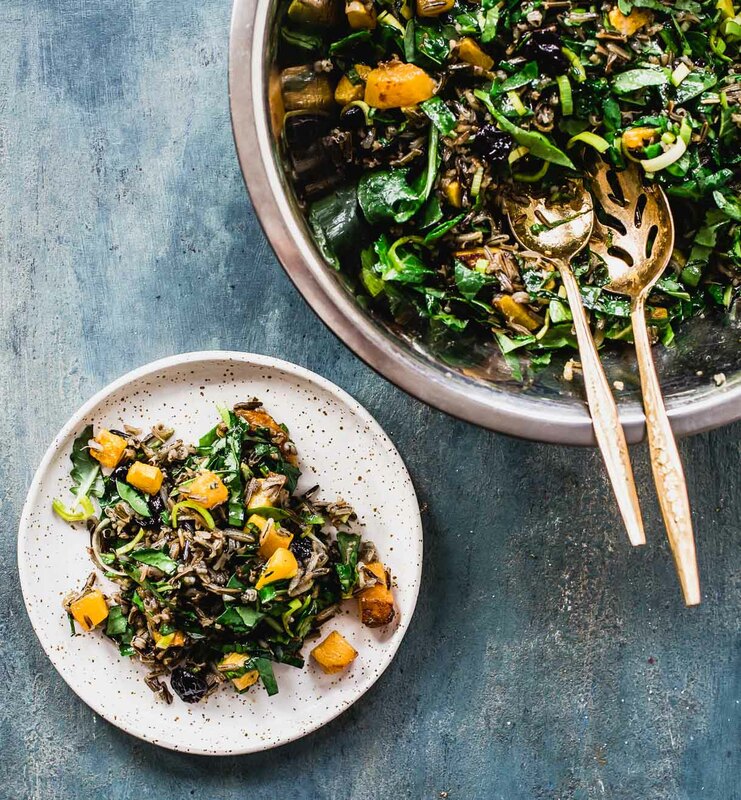 For this week of #SquashLove, I thought I’d share one of my favorite recipes from the book, this vibrant & nourishing Wild Rice and Butternut Squash Salad. I also thought it would be fun to answer 3 of the questions people ask me about my writing and this vegetable I’m so smitten with. A whole book on squash? Why? When my publisher contacted me in early 2013 about writing a book for their Northern Plate Series, each being a cookbook and resource guide on a single Midwest ingredient that has been a strong part of our culture, I immediately knew my proposal would be on squash. Living in an area where growing seasons are short and very unpredictable, squash is one of the only families that is nearly “in-season” all year round. Between the long and slender summer squash varieties, to the thick skinned blue hubbard and kabocha that last for months when cellared properly, the curcubit family holds a special place in my heart. They bring a sense of comfort and nostalgia, like your grandmother’s buttery zucchini bread or a butternut and sage pasta that warms your soul in the middle of winter. And then there’s the possibility of new ideas that I found so delicious and eye opening. Like how wonderful red kuri can be when braised in an ethopian spiced peanut stew or the silkiness that blue hubbard adds to a cinnamon spiced pudding, topped with macadamia nuts for good measure. What’s the best method for cutting open a winter squash? I also spent some time with The Kitchn, sharing my 7 tips to easily cut and prep any winter squash, not just butternut. You can find that article here. In short, it comes down to two key things: a very sharp knife & stabilization. Acorn and butternut are the only squashes I’ve tried. What other types do you suggest I explore? Butternut and acorn are no slouch in the squash family, but we tend to make those all the time because they’re familiar. However, one of the reasons I wrote the book was to introduce people to the other delicious varieties that farmers are growing. Most of the time people see a kabocha, delicata or blue hubbard, they’re a little unsure of what they taste like or how to prepare them so they pass them by. It’s kind of like how people used to perceive weird looking or oddly colored tomatoes. Once you try one, you’ll fall in love with the unique differences in taste and texture. Challenge yourself this year by picking one up that you’ve never cooked with and experiment. That was the way I started, and my book can help guide you through using them in the kitchen. On a side note, I think squash is the new pumpkin in terms of seasonal baking. Less water content and starchier flesh makes the puree a wonder to work with. Give that a whirl and let me know what you think! Press play to watch the quick tutorial on how to make this Vegan Butternut Squash Recipe! To make dressing, add all ingredients to a jar and use immersion blender to puree. Or whisk thoroughly by hand. Set aside. Preheat oven to 400 degrees F. Toss squash with olive oil, salt and pepper. Spread onto a baking sheet and roast for about 25 minutes, stirring once, until fork tender. In a large bowl, combine spinach, leeks, cherries and basil. 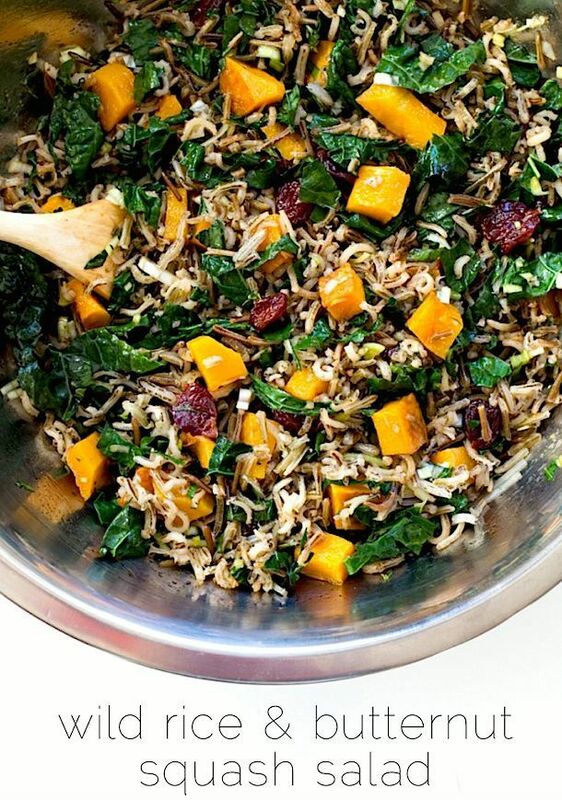 Stir in warm rice and squash so that spinach wilts slightly from the heat. Stir dressing (recipe below) into salad; taste and adjust salt level if needed. Serve at room temperature. Ooo! I’m looking forward to seeing your new cookbook. You’re right about the comforting nature of squash all year round. And now you’ve convinced me to pick up a new squash at the market today. I love how creative this recipe is – yum! I’m always stuck for ideas when it comes to squash so I’ll definitely be checking your book out! OK, I simply had to comment to say you blew my mind with keeping the squash skin for soups. That’s brilliant! I sense much more flavourful veggie stocks in my future. Thank you! Ksenia, thanks for stopping by and watching the video! I always feel useful when I am able to incorporate the whole plant into my cooking. have a great weekend! Definitely pinning this for Thanksgiving! It sounds like a perfect fall side. aw, thanks Autumn! it really is a nice colorful dish for thanksgiving. and it’s gluten-free and vegan, which is always nice just in case. I love squash. It’s the BEST. But I wish it wasn’t so darn difficult to cut up! And this dish sounds amazing! Thank you Joyti, and I’m so glad you stopped by as I hopped on over to your site and I love it. Such beautiful work. And on a side note, San Fran is my dream city. Jealous :) Hope the video above helps with cutting up winter squash, I know it can be a litte frustrating. Ooh, this salad looks lovely! I bet it would be a perfect side dish for Thanksgiving. I really enjoy squash, but haven’t branched out into the lesser-known varieties yet. Once I do, I will be going back to this video to figure out the prep work involved – what a great resource! I’m thrilled to have found you! Congratulations on your beautiful book! Butternut squash is a favorite of mine, so I’m super excited about it! This salad is just gorgeous! Caroline, i’m so glad you left this note – I had just discovered you literally minutes ago after you started following me on twitter. I love squash + five spice so when I saw it on your blog I was excited that we think alike! And that coconut shrimp soup looks amazing too. Happy we’ve connected! I’m trying this tonight! I just made Roasted Butternut Squash Soup this weekend and it was delicious! We’re going low sodium these day so looking for new recipes with good seasonings. Oh wonderful Rita! I hope you enjoyed it. This recipe is great for a low sodium option because so much of the flavor is in the natural ingredients. This looks amazing Amanda – Pinned! 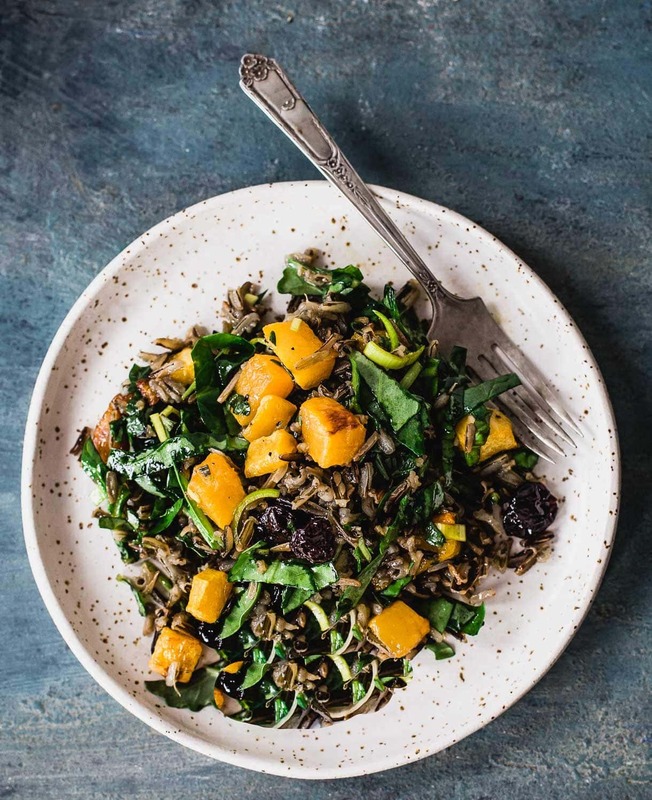 Definitely try kabocha squash – my favourite food! It’s super nutty and sweet, almost like a chestnut! Delicious! Hi Millie! I love kabocha too. In fact, there’s a whole section on it in my book! This salad is fantastic!! We made it tonight and are eating it in about 5 min (of course I had to taste it before dinner :) ). Thanks for the tips on squash cutting too. Very well placed video! John, so glad you enjoyed this salad! Knowing that you watched the video and put it to use is awesome. Have a great fall! Can you please explain how to massage Kale. I’ve never heard that term. Just made your Brussel Sprouts and Squash w/orange last night! AMAZING! and tonight because we had the stuff from our CSA I made the Wild Rice/Butternut Squash Salad-so GOOD!!!!!! My family is in LOVE with both. One question…in the salad did you cook the leeks at all or did you just wash and chop them and put them in raw. This year is the first time I have ever cooked with leeks, so I just wilted them a little in a pan while the rice cooked. Can’t wait to try you brussel sprout/kale w/ tofu recipe!!! so glad I found your website. Just got this on the shopping list! Bringing it to our family Thanksgiving!! So excited – it looks amazing :D Thanks for the recipe! Kaitlin, thank you for coming back to let me know you enjoy the wild rice salad! It’s all good to hear what other people think :) Have a great rest of the week! I am Kaitlin’s SIL – she shared this during both holidays. Just returned to MN, and made my own batch with roasted red onions instead of leeks and toasted pecans instead of cranberries – a new favorite, and so healthy!!! Can’t wait to try more of your recipes! I just made this last night. It was wonderful! I modified it just a little bit – I had leftover roasted garlic so I used a clove of it in the dressing and I crushed some walnuts into the salad for a crunch factor. Everyone was impressed by the salad and the delicious dressing. Thank you for a gluten-free, healthy and flavorful recipe! Rebecca, I love the idea of added roasted garlic to the dressing! Add walnuts sound perfect too. So glad your family enjoyed it. You can peel your butternut squash with a good potato peeler and save much more squash. Hi Melissa, thanks for stopping by! You definitely can use a potato peeler, but I find that a good sharp knife is much more efficient and you really don’t take away that much of the flesh. If your knife is dull, you’ll have to dig further into the flesh. Hope you’re having a great Sunday! I absolutely love this salad. It’s perfectly balanced, healthy and delicious! I leave out the leeks because I personally don’t love them, and the salad is still excellent. 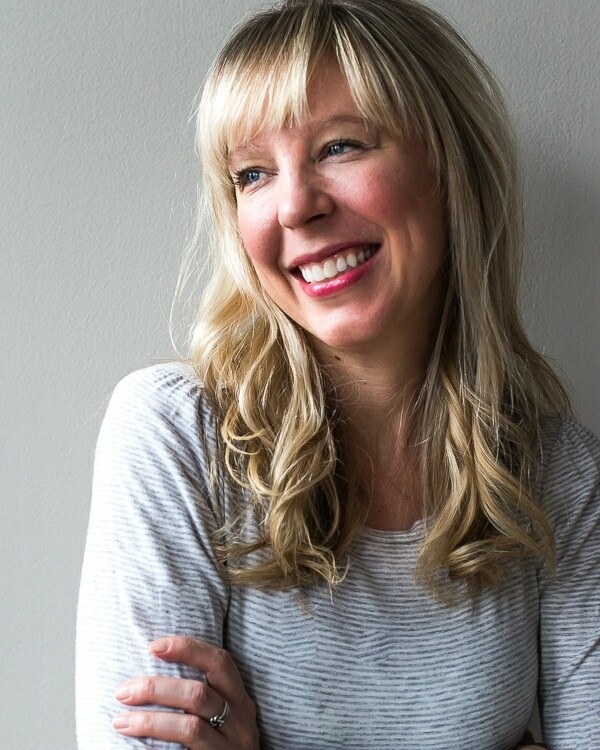 So grateful we stumbled upon this and look forward to trying more of your genius recipes. Hi! 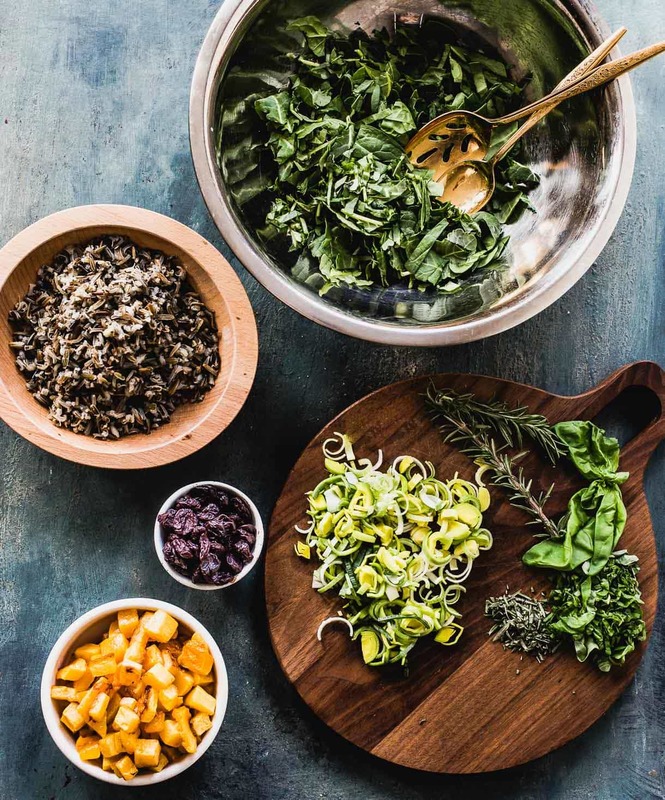 You should mix it all today, while the wild rice is still warm as that is key for it to soak up the dressing and really infuse the flavors. Once all mixed, let it cool to room temp, then refrigerate, and take out an hour before serving to come to room temp. omgosh…… am right in the middle of making this dish and i bought uncle bens wild rice in a box…… can i use this, or must i use plain wild rice????? am worried about the extra seasonings!!! This is fantastic! I have made this salad multiple times, and am taking it to our extended family Thanksgiving Feast today! I know it will be enjoyed, as it is with my family! Thank you so much for your creativity, and healthy ingredients! Ever subbed quinoa for the wild rice? i haven’t, but i think it would be delicious! let me know if you try it that way.